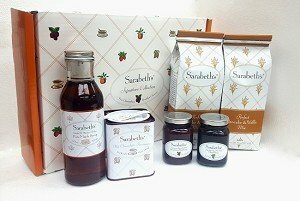 Sarabeth's Signature Collection 6 Piece Gift Box Set - Jams, Pancake Mix, Hot Chocoloate, and Syrup - Pack of 2 - The Perfect Gift for Food Lovers - A gift for the truly special person or persons in your life. Designed especially for the Sarabeth breakfast aficionado. Contains 2 Sarabeth's Pancake Mixes, 12oz Hot Chocolate Parisienne, two 5.5 oz. jams and Maple Syrup. A gift for the truly special person or persons in your life. Designed especially for the Sarabeth breakfast aficionado. Contains 2 Sarabeth's Pancake Mixes, 12oz Hot Chocolate Parisienne, two 5.5 oz. jams and Maple Syrup.